If you’ve found yourself sweating in a smoky billiard room, wondering what role customer data should play in finance—as well as in your company’s long-term strategy—this eBook will help you hone your pool shark skills. Inside, you’ll find insights about…. How to identify patterns in your customer portfolio, and why it matters. Avoiding four critical data billiard blunders. Key questions to ask while you’re segmenting your data. How to tell if your portfolio segmentation strategy is working with the right reporting. 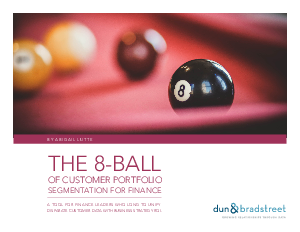 This eBook will help you navigate the crowded billiard room of customer data and how you can use it to drive cross-functional value for your team.